Tennis elbow also known as lateral epicondylitis or extensor tendinopathy is a common disorder that presents as pain at the outside of the elbow during lifting, gripping, playing tennis and other repetitive tasks that involve finger, wrist and elbow motion. The elbow joint is made up of three bones: the upper arm (humerus) and the two bones in your forearm (radius and ulna). The bony bumps at the bottom of the humerus are called epicondyles and the outside (lateral side) is called the lateral epicondyle. Muscles, ligaments and tendons cross from the upper arm and forearm to insert onto the bones of the elbow. The muscles on the back of your forearm are called extensors because they extend the wrist and fingers. The extensor muscles turn into tendons, which attach to the lateral epicondyle of the humerus. The muscle and tendon typically involved in tennis elbow is called the extensor carpi radialis brevis. This muscle produces the motion of wrist extension, which is required for gripping, lifting and performing a backhand in tennis. Other muscles that may be involved in tennis elbow may include: extensor carpi radialis longus, anconeus and extensor digitorum. Overuse of the extensor tendons due to excessive movement of the elbow and wrist may lead to overloading of the tendon and subsequent injury. When the muscles and tendons are weakened from overuse, microscopic tears form in the tendon. This leads to early inflammation and subsequent weakening of the tendon, pain and dysfunction. The features of tennis elbow or lateral epicondylitis are similar to those of other common tendon disorders (ie: achillies tendonitis, patellar tendonitis). 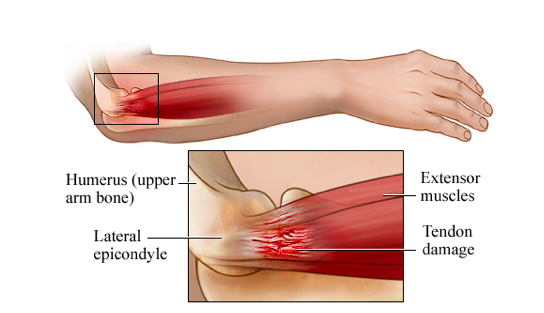 In tennis elbow and other painful tendon conditions it is more common to find changes in the tendon that are degenerative (tendon thickening, partial tears, and swelling) in nature vs. inflammatory. Though epicondylitis suggests an inflammatory process, acute inflammation only occurs in the early stages of the condition or possibly can occur with continued re-aggravation. Tennis elbow can be characterized by a spectrum of severity from mildly irritating to a debilitating condition. Tennis elbow may have a chronic course lasting anywhere from several months to years, with frequent reoccurrences. Gradual onset of pain, heightened during periods of physical activity. Pain and tenderness on the lateral epicondyle (outside point of the elbow). Reduced grip strength and pain with gripping. Pain aggravated by: tennis, gripping, lifting, and other daily activities and sports that require wrist extension. Pain may be described as: sharp and intermittent, localized around the lateral epicondyle but may radiate into the forearm muscles as well. History of increased resistance activity or increased duration of activity. Acute trauma to the elbow (less common). Your chiropractor will conduct a thorough physical examination in order to rule out other potential causes of your elbow pain. In addition to tennis elbow the following diagnoses can cause symptoms that are similar to those of tennis elbow. These conditions need to be ruled out during the physical examination to ensure correct diagnosis and treatment. In addition to elbow pain patients may also experience elbow stiffness, impingement, locking and or clicking. In addition to elbow pain, patients may also experience, aching into the forearm, and or sharp shooting pain into the forearm that is worse at night. In addition to elbow pain patients may experience, weakness in the fingers and thumb, and pain into the forearm and wrist. When the nerves in the neck are irritated or injured it can lead to symptoms into the shoulder, elbow, forearm, wrist and or hand. Symptoms typically are worsened by neck movements, and may involve: numbness, tingling, burning, weakness and pain into the upper extremities and neck. Do I need a Tennis Elbow Brace or a Tennis Elbow Strap? Tennis Elbow braces are believed to decrease forces at the elbow by absorbing some of the tensile forces that are generated by the wrist extensors at that location. This strap is worn near the insertion of the wrist extensors just below the elbow. Elbow splints and straps are often prescribed for the treatment of tennis elbow. These are intended to restrict forearm movement and relieve loads on the origin of the extensor muscles (near the elbow). There are various types of braces and straps that may provide various benefits for the patient. Some studies have found that patients who wore a spiral splint that restricted wrist extension as well as supination and pronation (rotational movement at the wrist) had significantly reduced pain and improved function in grip strength after 4 weeks of use. Splints and straps may be helpful to reduce initial pain and disability but should not be used as a stand-alone treatment. Once the extensor tendon has undergone degenerative change, strengthening exercises and treatments are required to rebuild the tendon strength and improve overall function. Treatment for Tennis Elbow: How the Mountain Health and Performance team can help! There are various complexities associated with the anatomy, biomechanics and pathophysiology of tennis elbow. It is therefore unsurprising that numerous treatment options are described in the literature to be both effective and ineffective in cases of tennis elbow. For this reason, a single intervention or one-size fits all approach to tennis elbow is not going to be effective for every case. Treatments should be tailored to the individual patient, pathology and clinical presentation of the condition. For this reason it’s critical to have a proper assessment and diagnosis before starting a self-treatment or rehabilitation plan. These myofascial release techniques are utilized to address any abnormal soft-tissue tension associated with tennis elbow. 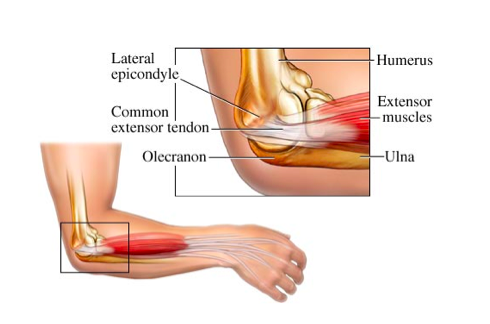 Tension in the muscles of the forearm, arm and shoulder may lead to improper biomechanics and increased stress at the elbow, which may contribute the overloading of the extensor tendon(s). Myofascial release can help to decrease the abnormal tension in the muscles and fascia and improve overall motion in these areas. Small studies have found ART to have additional treatment effects compared with ultrasound, muscle stretching and strengthening exercises for tennis elbow in the short term. There is evidence that manual therapy techniques have immediate effects on pain and grip strength in patients with tennis elbow. Mobilization and or manipulation may be targeted at affected joints including the neck, shoulder, elbow and wrist, depending on the function of these joints upon examination. Manipulation of the elbow has been shown to provide pain relief within the first few treatments, up until an 8-week follow up of patients with tennis elbow. At Mountain Health and Performance we offer class IV laser therapy, which helps to stimulate deep tissue healing on a cellular level. When targeting the extensor tendons and muscles, laser therapy can help to increase energy for cellular healing. It also improves blood flow, which increases the amount of oxygen and nutrients delivered to the damaged tissue in order to speed healing and tissue regeneration. Laser therapy has been found to be effective in reducing pain and improving grip strength, especially when used with exercise therapy in patients with tennis elbow. Kinesiotape is a non-invasive therapy used for pain relief, lymphatic flow, joint support and improved joint and muscular awareness. Kinesiotaping has been found to help decrease pain, improve grip strength and in some cases may be used as an adjunct or in the place of a brace or strap. Some studies have found that patients receiving manual therapy/exercise and kinsiotaping had superior results to manual therapy/exercise alone without taping, indicating that it may be a useful addition to care. Traditionally rest was regarded as an effective intervention for tendon injuries, however there has been a recent shift towards early rehabilitation. Eccentric loading (which is a specific way to load the muscles and tendons) has been shown to improve collagen alignment, and stimulate collagen cross-linking, which improve strength in weakened tendon. Eccentric exercises are found to have a positive effect on pain, function and patient satisfaction, return to work vs. traditional concentric exercise, stretching, splinting and ultrasound. Eccentric wrist curls and the use of the flexbar (a popular treatment for tennis elbow) are both great ways to stimulate tendon healing. The flexbar is a rubber bar that is sometimes prescribed, which helps patients perform eccentric exercises without weights or bands. Though these treatments are great options for some patients, other patients may not be ready to perform eccentric exercises right away. Some patients have a reactive tendinopathy, which may require hands-on treatment to reduce pain and less intense exercises to strengthen the tendons without the risk of overloading them. These may include gentle isometric exercises and exercises to target other joints that are dysfunctional (i.e. : shoulder exercises, neck exercises etc.). Though stretching the forearm muscles may provide short-term pain relief and can potentially decrease some of the strain on the tendon, stretching alone will not heal your tennis elbow. Tennis elbow, as discussed above, is a degenerative tendon condition and exercises are critical to rebuild the tendon and normalize function. It’s very important to get a proper assessment and diagnosis to direct proper treatment. There is no one size fits all approach to treating tennis elbow, so what works for one person may not work for you, or worse may aggravate your symptoms. Lifting with the forearm pronated (turned inwards)- try lifting with the forearm and wrist in a neutral position. Work tasks, which are highly repetitive for the elbow, forearm and wrist.